DIY Income Investor: Dividends Uncovered? 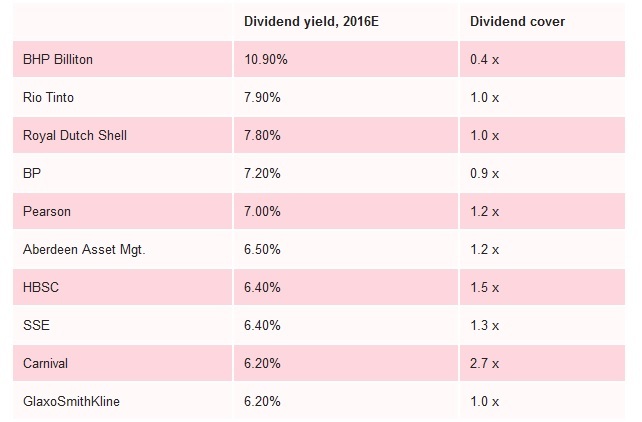 'Dividend cover' is one of the key ratios that income investors should be looking at, as it is a measure of how affordable the dividend payments are for a company. However, like most things in investing, it pays to do a little more research into the underlying situation - and the level of commitment of the company management to income-oriented investors. As most DIY Income Investors will be aware, 'dividend cover' is usually given as the ratio of the company's net profit to the dividend payout - in other words, how many times the company could pay out the dividend from profits. Ideally you would like to see dividends covered at least twice, or at least one-and-a-half times. Usually companies like to be consistent with dividends - maintaining them or increasing them. However, sometimes the dividend just gets out of whack with the level of profit when times are hard and occasionally drastic action is needed in order to demonstrate responsible financial management. The management know that cutting the dividend will send a powerful message to the market - but this message is mixed: both negative and positive, The usual response is a fall in share price, which means the dreaded 'double whammy' for DIY Income Investors (loss of dividend and fall in share price). So I was interested to see a recent article from one of my share dealing companies, AJ Bell YouInvest: 'Dividend cover on high yielding stocks looks thin for 2016'. 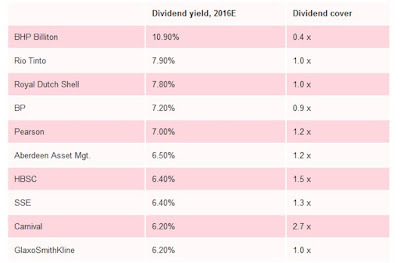 The article notes that:"When it comes to the fattest yields from the FTSE 100 right now, cover is skinnier than ideal with only 1 of the top 10 having dividend cover over two"
Carnival (the cruise ship operator) is highlighted as the only one of the top 10 to have a comfortable dividend cover. I like a cruise myself - and the fall in the price of oil is likely to have a positive effect on their cashflow. One to consider, maybe? The article picks out Shell as a company that hasn't reduced its dividend for decades - perhaps the current low oil price is an opportunity to pick up some income cheaply? Good luck with your 2016 stock picks! carnival seem to yield 1.9% and even increasing to $1.20 for 2016 would only be 2%. Special div is possible and not reflected in cover ratio. P/e 21. When stock markets plunge 40% this year you guys are gonna lose all your dividends and most of your capital. This is proverbial picking pennies in front of steamrollers. I know you're trying to focus on value, but with central banks distorting markets, there is no value... just bs. Well Anon, if you have that power of foresight you should be a millionaire by now! But even with the horrible 6 or 7 months we have had, my portfolio is down only around 5% in the 2015/16 FY. Not happy about it but it's far from being a disaster for this investing style.